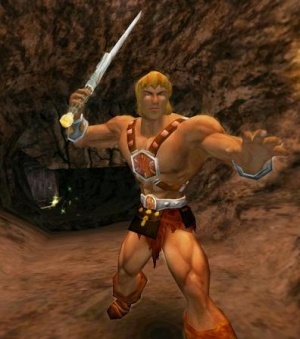 THQ has signed a new deal to bring classic Mattel properties such as He-Man to videogames. THQ and Mattel have agreed to a new multi-year alliance that will see many new toy properties converted to videogame form. Barbie and Hot Wheels videogames have been in the continued spotlight through other publishers such as Activision, but the return of He-Man is a notable part of the contract with THQ. Part of the deal between the videogame publisher and the toy giant includes videogames based on the Masters of the Universe brand, which features characters such as He-Man, She-Ra, Skeletor, and black mage lookalike Orko. Other properties named are Barbie, Hot Wheels, Fisher-Price, Rock 'Em Sock 'Em Robots, Polly Pocket, Monster High, and more. Using these franchises, THQ plans to develop games for multiple platforms including consoles, handhelds, mobile devices, social networks, and digitial distribution portals like Xbox Live Arcade and the PlayStation Network. It'll also delve into Mattel's brands to create new content for uDraw, THQ's popular drawing tablet peripheral for the Wii. So unless you were in love with Barbie: Horse Adventures, the bad news is more Barbie games are on the way, but they'll be from a different publisher this time. The good news is that we'll likely see He-Man, the coolest property on that list, return to gaming for the first time since the PS2 era. He-Man is a property that has been largely ignored by the videogame industry, with only a handful of titles released featuring the man that is a he over the past thirty years. It's baffling, because he's a giant guy with a sword that battles a man with a skull for a face, a premise ripe for videogame use. THQ and Mattel are already developing certain games based on these properties, with plans to announce them throughout 2011. The two hope to have the first titles from the deal on retail shelves by the holiday season.